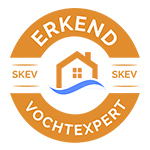 Last of Vocht.nl is part of Heemsteeds Vochtweringsbedrijf Okx (H.V.O.) and is your specialist in the field of moisture control since 1989. We have the knowledge and experience to solve every occurring moisture problem in homes and company buildings completely for you. We do small projects such as simple leaks in cellars as well as large projects such as complete and complex cellar renovations. Work is carried out for private individuals, Association of Owners, managers and developers of real estate. But also for contractors who, among other things, do foundation repair in combination with building a new concrete cellar. In addition to the moisture problems in cellars, we also treat rising damp through the injection of construction walls as well as concrete repair. Through the right combination of specialist knowledge, experience and equipment, we are always able to offer the best solutions. Whatever problem you have, we solve it in an efficient and professional manner. H.V.O. is a flexible organization that always listens to the wishes of the customer.